We really weren’t prepared for what we found in Sicily. 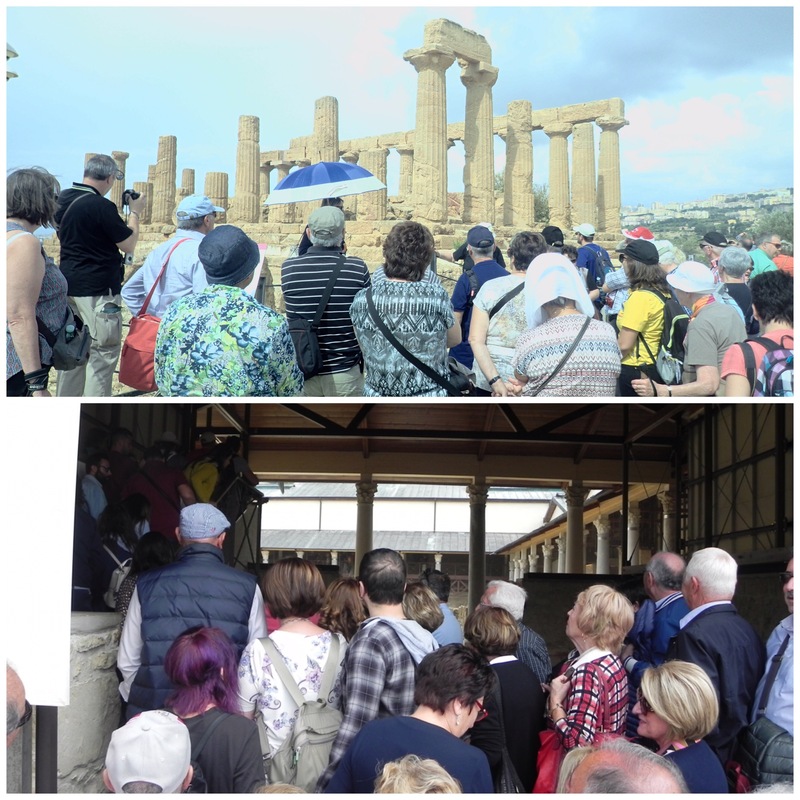 Yes, we knew that Sicily had been conquered many times–Greeks, Carthaginians, Phoenicians, Romans, Arabs, Normans, Spanish–and we knew there were plenty of ancient archeological sites to visit, but the size, beauty, and the incredible state of preservation of the sites was truly amazing. A caveat: while we have an amateur’s interest in archeology, neither of us is really very knowledgeable about the ancient world. We leave that to people smarter and more serious than us. Part of the reason that the ancient sites are so well preserved is that many are in remote corners of Sicily. That means a rental car or a bus tour. There are a few sites, such as Ortygia in Syracuse, the Greek theater in Taormina that can be easily reached, but most are a drive from the major cities of Catania and Palermo. The good news: a “drive” in Sicily usually means two hours at most. Another option is to join a group and take an excursion by bus, and we saw plenty of those in the parking lots adjoining the sites. The upside to a tour is that you usually get a knowledgeable guide–but not always. We did run into an Italian guide leading a group of thirty in the Villa Romana del Casale site reading verbatim from a guide book. Another Italian guide turned to us, very frustrated and angry, and said in English, “I don’t know why they let him in here! He knows nothing about this place.” The downside of a bus tour is that you are often in a crowd and herded at the guide’s pace, leaving little time to linger at what interests you. We opted for the rental car and a good guide book. That gave us the flexibility to set our own itinerary and pacing. The visits almost always involved a full day–most sites are enormous. Leave for the site in the morning, tour until early afternoon, eat lunch at a country restaurant, tour a little more, and home for dinner. We visited five major archeological sites: the Greek theater in Taormina, Villa Romana del Casale, Morgantina, Valle dei Templi, and Segesta. Each was unique and world class. There were many more that we didn’t have time to explore. 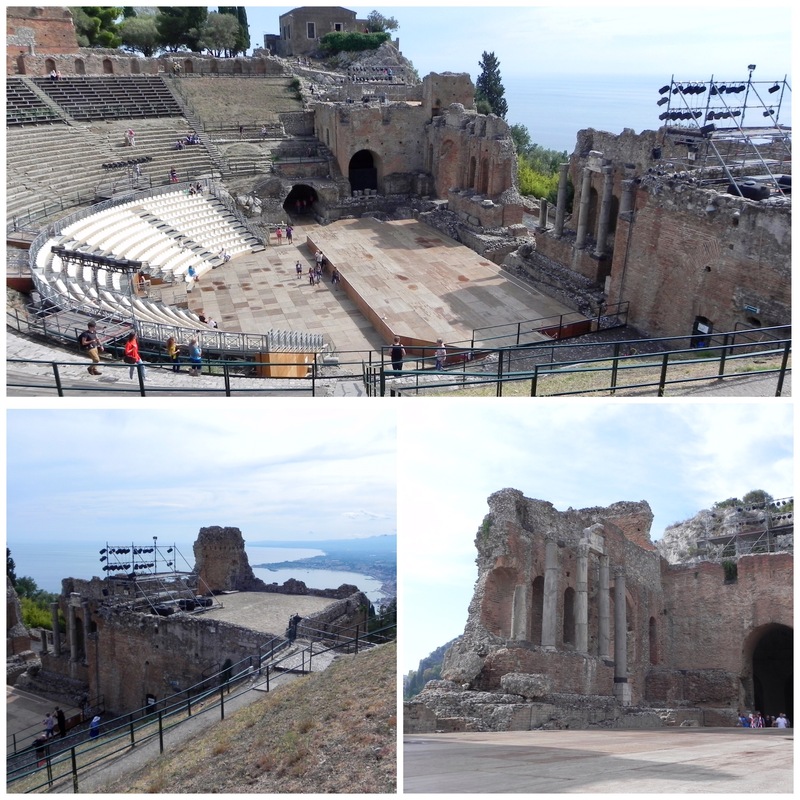 Easily the most accessible site was the Greek theater in Taormina, literally in Taormina itself. No car necessary–in fact, no cars allowed in the center of town. The theater is actually a Roman theater built on top of a Greek theater. The enormous size, and brick and cement construction techniques do scream Roman, not Greek. The setting is otherworldly, perched on a cliff, the open end of the theater framing a view of Mt. Aetna. Even in ancient times, if the performance was a bust, you had the view to console you. The theater is so well preserved, it is still used for concerts today. 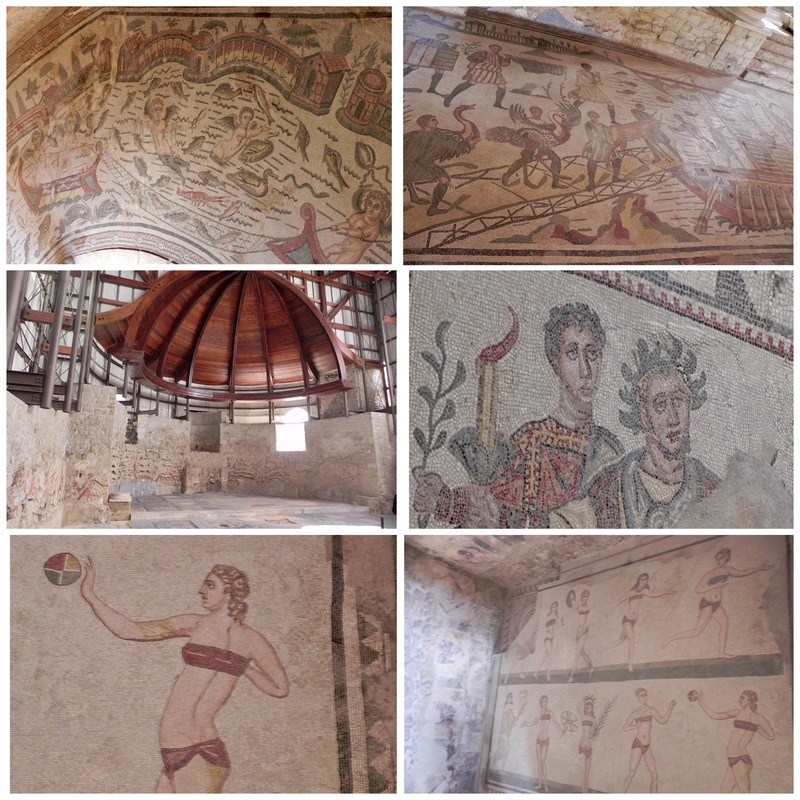 Villa Romana del Casale in remote central Sicily is famous for its absolutely stunning Roman floor mosaics with dramatic hunting scenes, bikini clad women athletes, scenes from the Odyssey, and lots and lots of exotic animals. The site itself is the ruins of a very large Roman villa, now covered and crisscrossed with elevated walkways for visitors. The walkways are extremely narrow and often very crowded. Get there early when the doors are first opened or, as a Dutch couple we met suggested, tour during the afternoon lunch break when every Italian & tour bus group is eating a very big meal. The other archeological sites were large and open air, and with room for all the tourists and tour groups, so you never felt mobbed. Close to Villa Romano is Morgantina, the remains of a substantial Greek city perched on two hills. 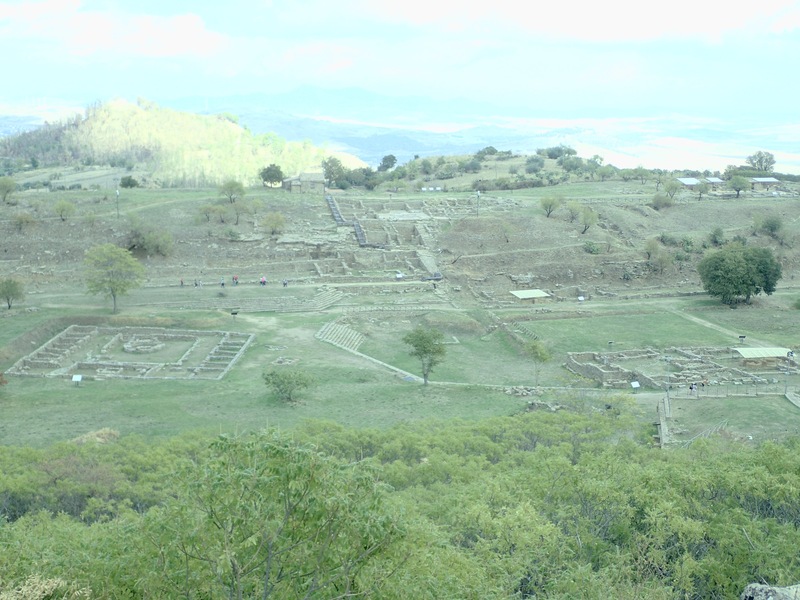 Morgantina is more of a working archeological site, enormous, with only small parts completely excavated. No crowds, in fact, barely anyone at all, even though we were there on the once monthly free admission day. You definitely got sense of a real city — two commercial market places or agoras (the original shopping malls), administrative offices, religious buildings, a theater, public meeting places and grid street pattern with very modern sounding names like West 7th Street. It was a very leisurely stroll in a beautiful setting. Unfortunately, unlike the other sites, there were no amenities (café, water fountain, gift shops) and most of the signs explaining the excavations had faded to a bleached white and were unreadable. The Valle dei Templi is probably the most famous and visited ancient site in Sicily. And with good reason. 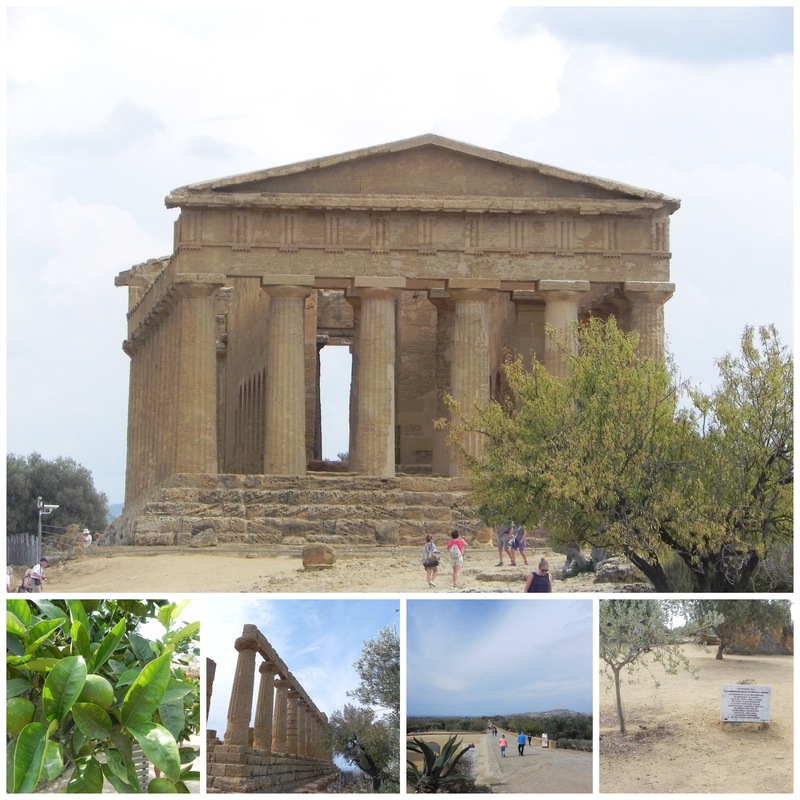 Near the town of Agrigento, the Valle dei Templi stretches along a sloping ridge for a mile and has the remains of seven Greek temples, several almost perfectly preserved. The setting, overlooking the sea, is breathtaking. The star is the Temple of Concordia. The size of the Parthenon, it is everything you want in a Greek temple–perfection of proportions, fully intact, and a stunning location. In addition to the temples, the Valle also has a remarkable “garden” in a gorge below the ridge full of citrus trees, palms, and other exotic plants. Here since ancient times, it offers a cool respite from the heat. There is also a moving modern addition, a memorial to heroes who lost their lives fighting violence and corruption around the world, including the two Sicilian judges, Borsellino and Falcone, who were murdered by the Mafia in 1992. 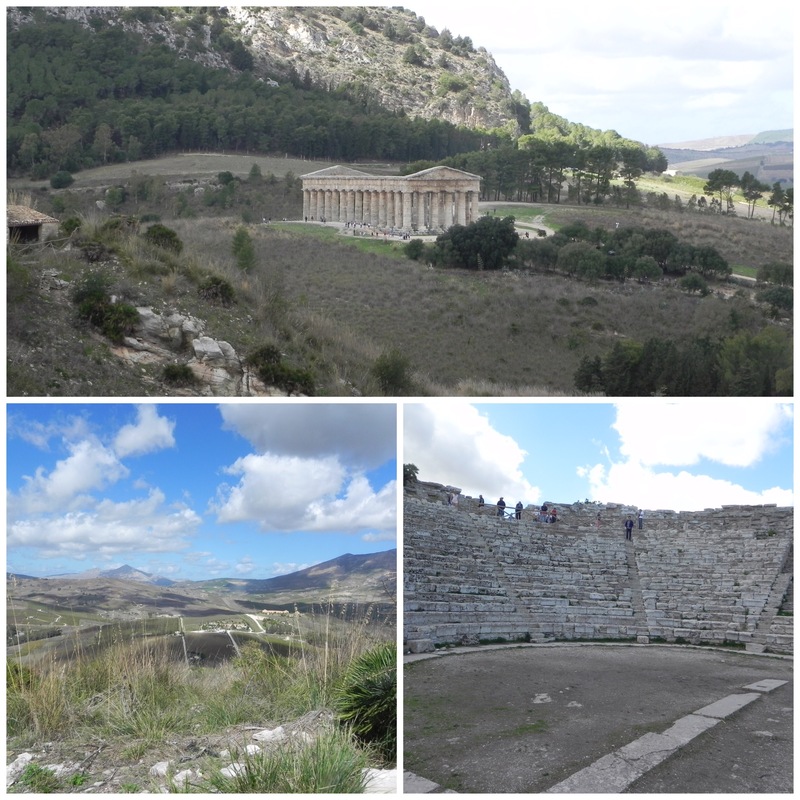 Perhaps the most evocative and picturesque of all the ancient sites we visited was Segesta. It is about and hour and a half west of Palermo in the hilly, remote Sicilian countryside. The good news is that the main east-west freeway goes right by the site so it easily reached by car or bus. 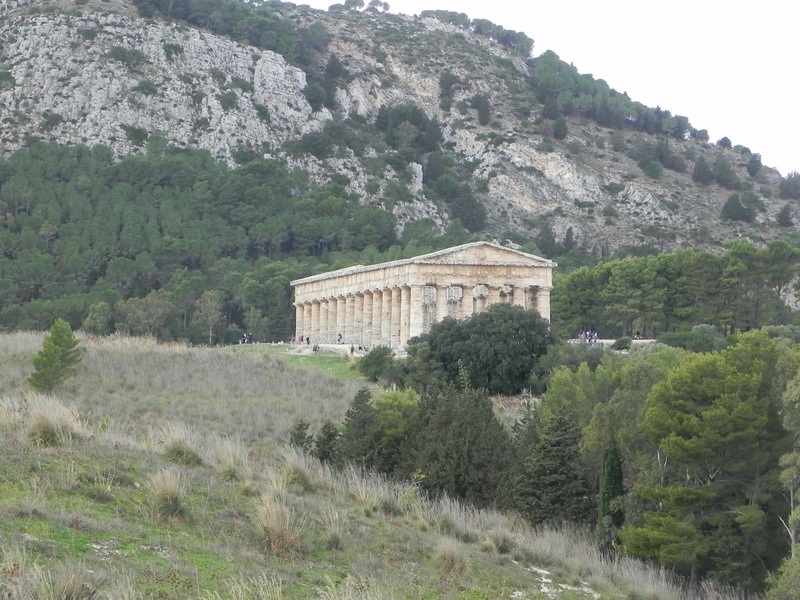 The magnificent temple of Segesta sits by itself below the ancient city of Segesta. When you climb up the steep hill (or take the shuttle bus) to the main archeological site, you get a truly breathtaking view of the temple below. Be prepared to fill up your camera’s memory card. The ancient city of Segesta has it all–a theater, an agora, fortified walls, kilns, ancient public baths and toilets. And the views! The temple below, across the rolling hills with olive trees, and out to the Gulf of Castellammare. And while we were touring, the view included a huge flock of sheep being herded by three dogs and shepherd, bells clanging. If you could visit only one ancient site in Sicily, Segesta would be our recommendation. 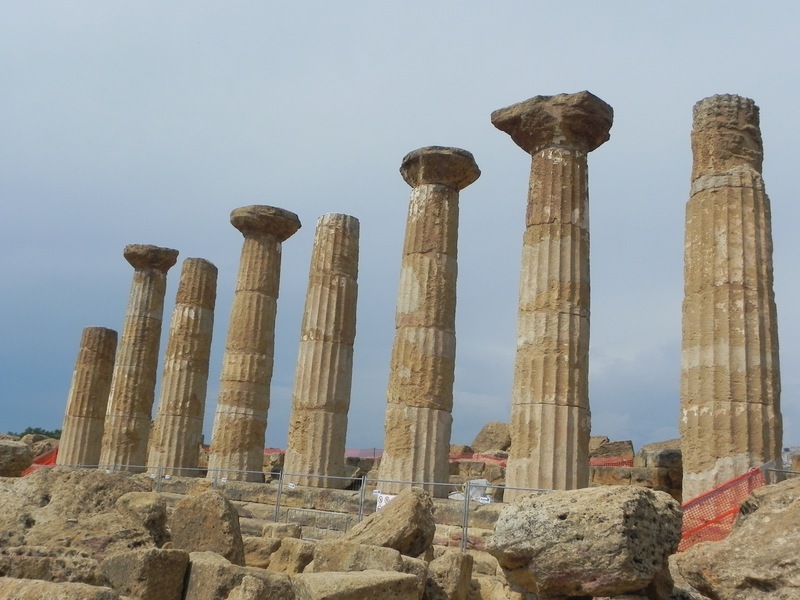 Sicily truly does offer the amateur archeologist or just curious tourist a lot to choose from–the only downside is which of the many world class ancient sites to visit. Next Post Driving in Sicily?